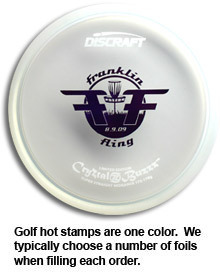 A custom hot stamp order requires a minimum of 100 discs with a minimum of 10 discs per model (see custom golf disc availability for more details). Our price guide is located here. Remember to order early: minimum turnaround time on custom orders is four weeks. NEW! Free design templates! Pick the one you like and we'll customize it with your club or tournament info. It is very important to adhere to our artwork specifications for hot stamp designs. These specifications ensure that your design will come out with the best resolution possible. Listed below are guidelines to help you get started to prepare artwork for your custom hot stamp design. Avoid designs that require excessive detail in the center of the disc. There is a nub in the center of the disc that can cause flaws in printing. Avoid large solid areas. Solid areas thicker than a half inch are not recommended, and can cause air bubbles to ruin your design. A good point of reference is to keep solid area no larger than a nickel. Please do not use half tones when creating your design. Your design needs to be submitted in black and white. To create a shading effect, it's better to use dots or lines of various sizes. The minimum dot per inch (DPI) for your artwork is 25. The minimum text size is 12 points. Text should contain no serifs. The minimum size for text with serifs is 28 points and it should be bold. Text should be plain and lack fine detail. Artwork for stamping will be at a maximum diameter of 4.5 inches. 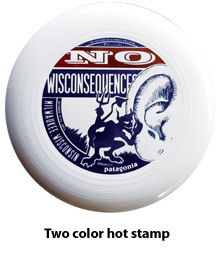 By following these important guidelines, you'll ensure that your custom hot stamp looks great on your discs. For more on designing and sending your artwork, please visit our section on designing artwork for custom Discraft discs.